I was told this is a follow-up novel to "Summer of Night", but it stands on its own. This had a pretty slow ramp-up and a weak ending, but there were still some interesting plot lines. Dale Stewart is a winey, self-destructive author and English professor that gives me little reason to care for him, and I wonder if that was intentional. He is 51 years old. His marriage is a wreck (or perhaps ended -don't quite remember), his mistress left him, and he is a suicide risk (1 failed attempt). He decided to go on sabbatical to Elm Haven, Illinois. He rents the home of his childhood friend (Dwayne) from 40+ years ago that had a strange death at 11 years old. Dale wants to investigate these events as inspiration for his next novel. There. I just saved you 10 chapters of dull prose. That is my biggest complaint of this book: A very slow ramp-up. We have needless side stories (like going to the store to get toiletries) and glimpses of his trips with his mistress. The book spent a great deal of time in this area and only started to get interesting halfway in. Portions of Dale's character really annoys me. Maybe I just can't emphasize with the life of a very depressed English professor. I tried, but I could not help getting frustrated when he saw his childhood bully 40 years later and suddenly turned in to a blubbering wimp. OK, so the guy was mean to you 40 years ago. It's time to move on. Another side story: A woman invites herself over and brought two bottles of wine which you both emptied. She is asking him what he is thinking about. He fumbles. Badly. She storms off. Do you really think the goal was to debate classic literature? I am so mad at this wimpy guy. He is also a horrible father. I'm not sure why the book bothered mentioning his (ex?) wife and kids. Wife nor kids made any appearance except to show that Dale is completely ignoring them. The mistress had many cut-scenes. Another useless sidebar that I actually found entertaining: troubleshooting the oddly behaved Windows 98 laptop and AOL account. It was tech support from 20 years ago. Amusing. If I ever write fiction, I'll try to avoid explaining modern day tech. 2/3 in to the book, I am now interested. Weird things started to happen. I am no longer sure what is real and what is fake. Neither is Dale. Perhaps he is simply crazy. I'll not spoil the details because this part was actually good. The book concludes rather blandly. I'm wondering if I am missing something because I never read Summer of Night. This story by itself does not stand strong on its own merit. 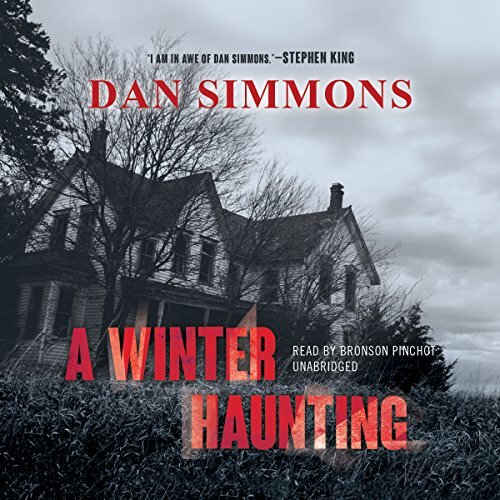 Discuss A Winter Haunting in the forums.